Disney Runs in the Family: I PASSED MY TEST!!!!!!!! A little over a year ago, I got a crazy idea that I wanted to add "running coach" to my fitness resume. I have been a fitness pro for a little over 14 years, sometimes working full-time, but mostly just doing it for fun while holding down a "real job". I hold quite a few certifications and licenses, and once I found my love for running, I knew coaching was something I wanted to do! You can't tell...but it's a BIG BOOK! 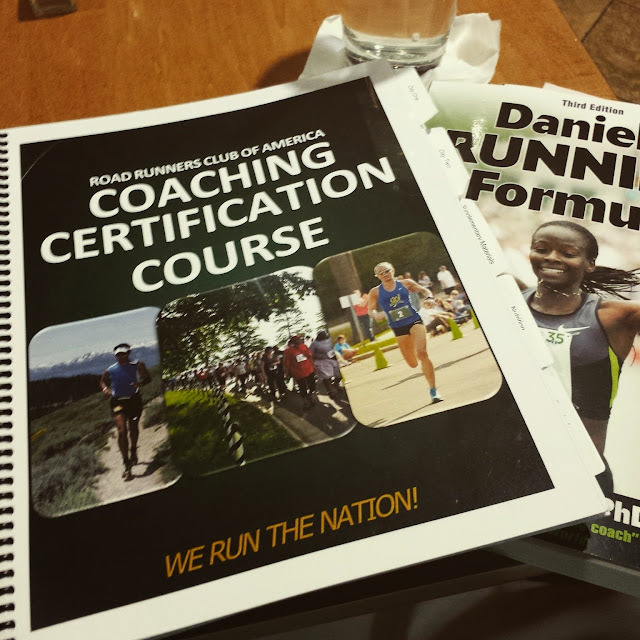 Two weeks ago, I finally had the opportunity to attend the Road Runners Club of America's Coach Certification Course in Denver, CO. These courses are not offered very often, so when there was one kind of close, I jumped on the chance to do it! The course consisted of a few activities before we arrived, but mostly 18 hours, in a room, talking about running. I never talked so much about running without ever lacing up a shoe! Honestly, though, I learned a TON--and I feel like I had already known a lot. I've "coached" myself through 5 marathons, Dopey, tons of halves and shorter distances, and figured I was pretty knowledgeable about training plans, etc. I was, but there was a lot more to know. Once those 2 days were over, we had 30 days to complete the exam. 100 questions. Had to get 85% or higher. Some questions were easy, others took a lot of thought, but at the end of the day I PASSED!!!!! 95% (and of course, I just am dying to know the 5 questions I missed...and yes, they will send them to me eventually). I'm so excited!!!!! 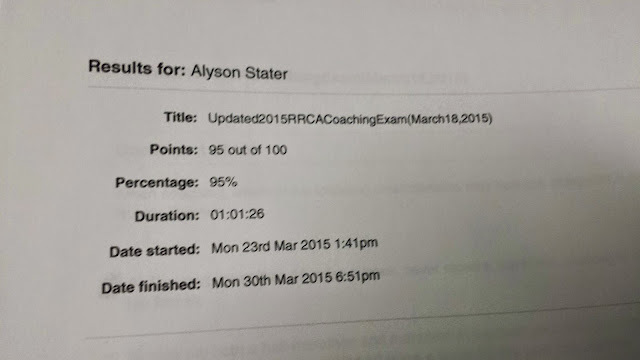 Now, I just need to renew my First Aid and CPR (which I'm doing Friday) and I am a fully-certified RRCA Running Coach! I cannot wait to coach runners online and, someday, in person and develop this side of my business. 2015 is really shaping up to be an amazing year of me chasing my dreams--I can't wait to see my year in review come December! Seriously people--go after your goals! You'll never regret taking a risk on yourself. Any other coaches out there? I'd love to connect and here how you got started coaching! Have you ever used a running coach?